Last week I moaned a little about the lack of new reads, so of course since then I received ALL THE BOOKS! I'm stoked with my new review novels as they're all titles I've been wanting to read for a while now, either because I've been hearing nothing but great things about them or they're written by authors I absolutely adore (Clarke, Colgan). I've already read a few of them and they were amazing but I'm reading quicker than I can review - so I'll post longer thoughts in the next few weeks. I'm also very happy with my copies of The Naughty Girls' Book Club and The Memory book, which I won in pre-birthday on Shaz's book blog giveaway, I can't wait to start reading them! 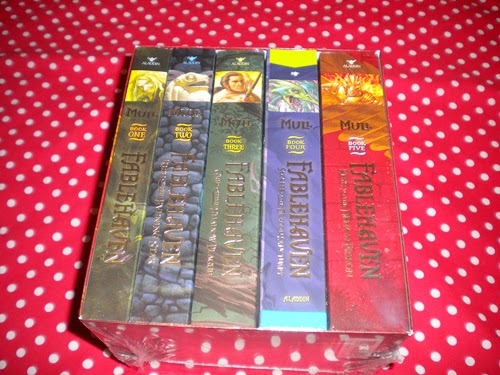 The big stack of Fablehaven novels were a belated birthday gift. They look very interesting and different from the type of novels I normally pick up, has anyone read this series yet? On Friday (also known as book giving day, ahum) Penguin held an brilliant campaign at St Pancras International station for The Fault In Our Stars. I read about it on Twitter and took an early lunch break to check it out. There was this huge display of the book on the lower concourse, an artist was drawing this amazing TFIOS art, I had my photo taken and I received a free copy of the book (which is brilliant because I only owned an e-copy so far) with matching book mark. It was a fantastic literary lunch outing and brightened up my otherwise dull work day. 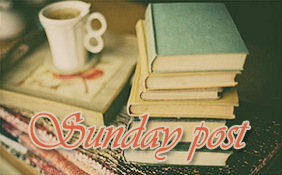 Enjoy your books and thanks for visiting my post! 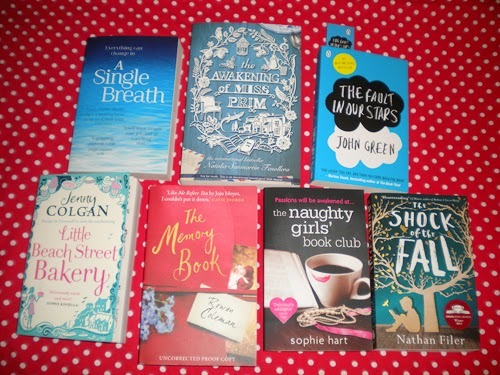 Great book haul & very pretty blog! I'm excited to read A Single Breath -really enjoyed Lucy Clarke's first novel. I got The Shock of the Fall this week too and have read it already. Wonderful book. You've got some great new books! The Naughty Girls' Book Club, The Beach Street Bakery and The Memory Book all caught my eye. I read the John Green book--it's very good. Hope you enjoy it and all the rest. What an awesome week. Enjoy your new books. Come see what I got at Ms. Martin Teaches Media and Inside of a Dog. Happy reading! I like the idea of book giving day much more than any "holiday." Seems like something I should implement.